As you all know from my previous posts I was unable to run the 7 Hills Challenge on Sunday so I headed up Carlton Hill to cheer on my mates who were running it. Since I was being petulant and in a huff 🙂 very kindly Lisa has provided me with a post for this race. “It seemed like a good idea at the time, but by the morning of the Seven Hills race when the alarm clock went off at 6am, I wasn’t so sure. Due to injury, Steph is stuck in trainers for all the wrong reasons, so this race was dedicated to her. 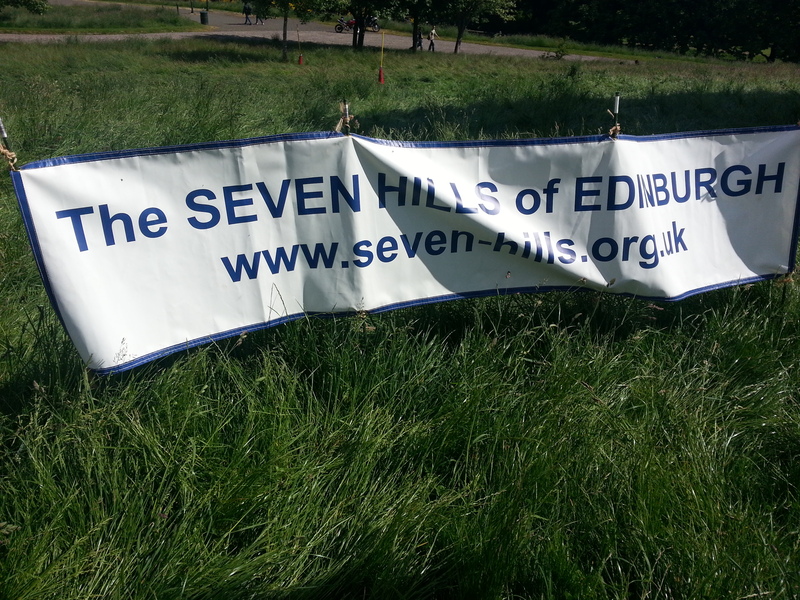 So thank you Steph for cajoling us to sign up for the seven hills, leading the way on training runs and for your cheerful farewells on the start line. I’d promised myself that if I finished the race then I could buy myself a t-shirt and if I got a sub 3 hour time then I could have a doughnut (one of those cream filled fudge doughnuts that Greggs teases you with). So much for that, I bought the t-shirt before the start of race! The start gun went off, the first of my energy gels fell to the floor and off we went. I made a new friend on the Royal Mile when we both got stopped by traffic and we stuck together and chatted away the Ks until Craiglockhart. I shot up the bank at Craiglockhurt like my tail was on fire, thought that I smiled for the camera at the top, but looking at the photos on the website, apparently not:> Felt pretty good at this point. I was advised that a pair of gloves were a good idea to help scramble up the hills. As it was a warm day I didn’t need them on for the whole race. What to do? Brainwave, stick them down my bra. Don’t try to imagine it……….. Took an ‘individual’ route between Blackford and Arthur Seat – the allotments are far too over rated, but didn’t lose too much time. Witnessed some interesting manoeuvres through the turn stile at Pollock and off up Arthur Seat I went. By this point my quads were on fire and as I crawled up to the top I couldn’t care less about the rabbit poop. If only I knew where those gloves went. What was humbling was to see the women’s race for life, and all those people running for charity when I bet the vast majority of us seven hills folk did it for nothing more than personal gain. Was wearing my lucky pink race vest, so I think most people thought I was in the Race for Life, but going in the wrong direction. Anyway, nearly there, finish line in sight, but I think they kept moving backwards. 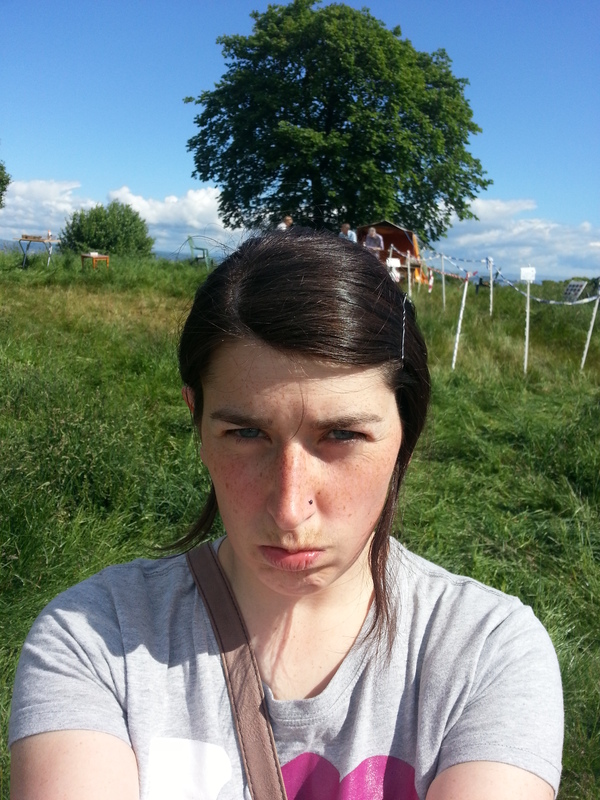 No chance of a sprint finish, but at least I didn’t vomit. Thank you to my new friend Martin for the enjoyable run to Craiglockhart and to those people who pointed me in the right direction when I was standing in the middle of the road looking gormless and of course to Steph, who is already talking about the training for next year. I finished in a miracle time of 2.17.29, came 9th out of 260 Challengers and was 2nd women, just a pity that I didn’t want that doughnut in the end. Did it, got the t shirt?? 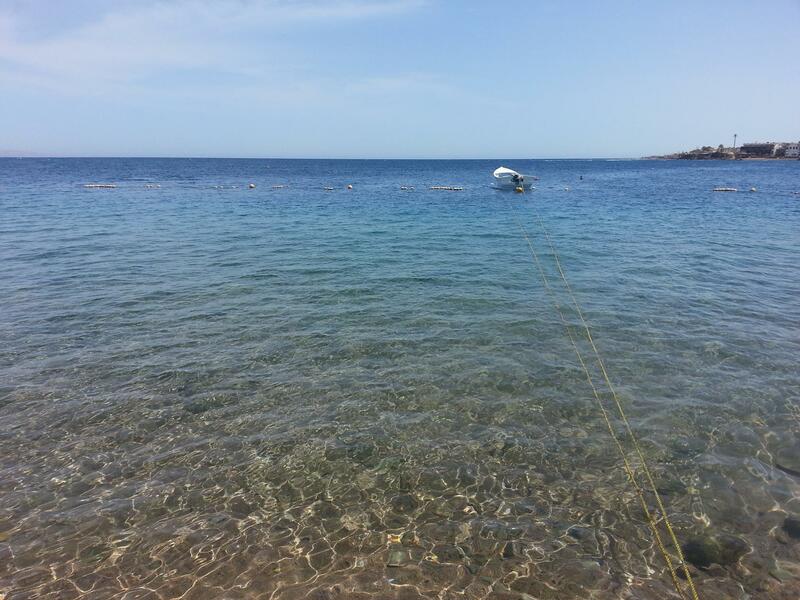 So during May I had to deal with a new challenge, I had a holiday abroad, not only that but somewhere hot. Now I am sorted on the ski gear and woolly hat front, running gear – tons of that. Beach wear?? Hmmm not so much of that. Quite frankly that kind of stuff isn’t really my style so it seemed a bit strange to be looking in my wardrobe trying to decide what to pack. I mentioned previously about finding a couple of sarongs and shorts in the charity bags my riding instructor gave me but when I tried on the shorts again they were slightly too tight, I have kept them because they are a nice fit and pattern. Next up swimwear, now I will be honest here and say that I had a perfectly serviceable swimming costume but that I wanted a different one. I wanted a bright colour and a nicer fit – I feel bad in a way for getting one as was clearly a want not a need and although I promised myself I would swim at least once a week when I got back that hasn’t materialised and now both swimming costumes are glaring accusingly at me whenever I open my underwear drawer. The other issue for me with swimwear is sizing, unfortunately I am largely limited to where I can get swimwear that will actually hold my chest in place not cause any embarrassing moments in the sea/pool. That meant that I spent £46 on a new swimming costume and used up 8 coupons in process. I am hoping that this feeling of guilt will spur me into swimming more so you never know in the long run it might help improve my fitness and I am all about that. My guilt has also been increased by Nik and Franca who are both participating in this challenge and both have vintage swimsuits that look absolutely amazing, there really was no need for the purchase. It is a must do better mark for me! 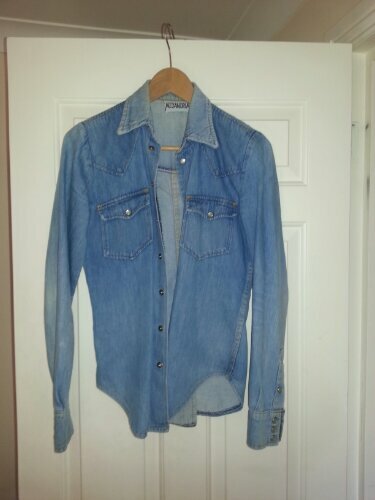 This shirt is older than me and looks 100x better! Next month – errr could someone remind me I am on WWC and also slap me each time I reach for the credit card? July needs to be a moratorium on any form of shopping, I will explain more in the June round up. Also to continue a theme I managed to borrow half an outfit for my dressage test and even had second hand jodhpurs to wear – I think you will agree I look sharp! I will be putting up a full post about the test later this week. Now I am well aware I am uncoordinated but I have been relatively lucky over the years and rarely had an injury that might make me pull out of a race. The last time that happened it was because a horse had stood on my foot. I am pretty sure you all realise what is coming! I was doing one of my final reccie runs of Arthur’s seat for the 7 hills on Friday lunchtime. The pace was good, I felt ok – given I had been out with colleagues drinking cocktails and gin & tonic this was impressive. We made our way up to pollock halls discussing best routes and idea of times, these guys I run with are much faster than me and this pushes me when I run with them. We ran around some fences put up in the car park for building work and suddenly I felt my foot land on something unstable, before I could do anything my ankle collapsed to the side and I fell down. I will be honest here and say I was a jessie and burst into tears. The guys I was running with were great, as were the builders. I had to hobble the mile back to the office but I kept it elevated, iced it and had it wrapped. I was sure it would ease and the 7 hills would be possible on the 16th. 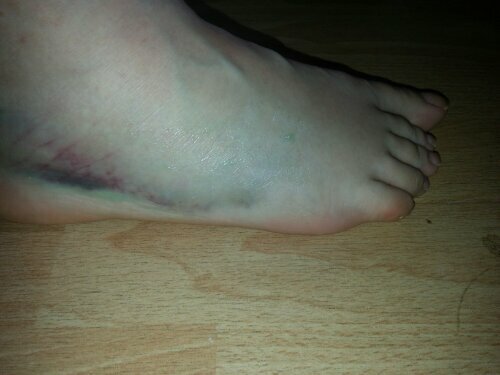 Well now it is the 9th, a week to go and my foot is swollen, painful and bruised. I can’t give up quite yet, not after all the training and the tribulations of that training. Plus it just looks beautiful! 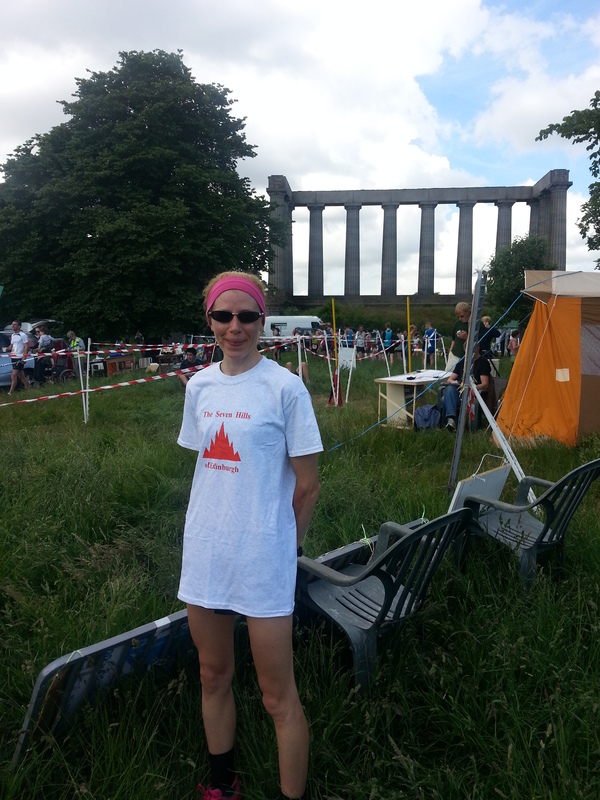 Hairy Haggis Relay – The Point I realise I am competitive over really bizarre things! I know this has been a long time coming, sorry about that. 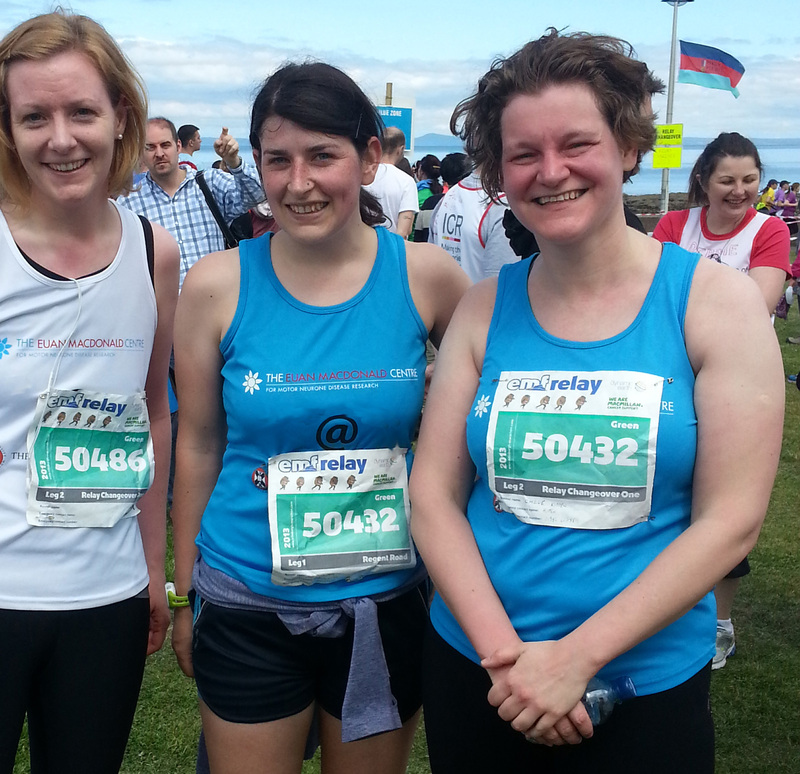 I thought i would just put together a short race review of the relay I took part in on Sunday 26th May. I ran the first leg for my team. We were a mixture of staff from the University and we were raising money for the Emc. Some were experienced runners others training for their first-ever race which meant it was a nice mixture although we were all joking around about being the fastest team. So Sunday dawned early but overcast. I had laid things but the night before and since we had team vests the clothing choices were made easier. I decided upon shorts as if this is the only summer we are getting the legs are coming out! I also put on my trusted sweaty betty long sleeved top as it looked a bit chilly outside. 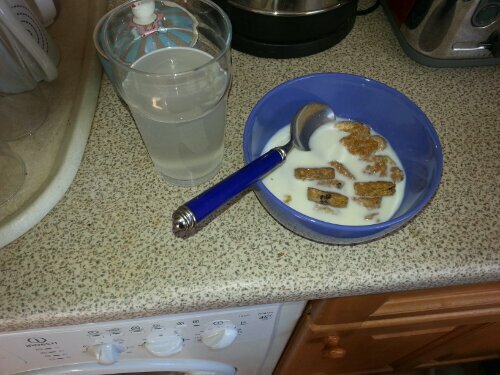 I had my breakfast of champions, note the electrolyte water. Then stuffed some money and gels in my shorts before dashing off for the bus. I started getting excited/nervous on the bus, there were a few other runners on the bus and as the bus made its way up Leith Walk there were more and more sporty looking people on the streets. My starting pen was one of the middle ones so I started on Regent Road, it was strange to be alone at the start I am used to running races alone but as I didn’t know the two first leg runners on the other teams I just hung about. At twenty five to ten I decided a trip to the loo was in order. It never fails to surprise me, there were literally tens of thousands of runners and about forty portaloos. Hmmm that one baffles me. Anyway as the minutes ticked away I started to get anxious, I didn’t want to let the team down by not starting on time. At five to I was at the front of the queue and dove into the next free loo. Out again as quick as possible only to realise that my start pen was the far end of the street, I hared off like a demon briefly questioning my wisdom to be running flat out before I had even crossed the timing mat. Once I had squeezed into the pen behind mine I started to take in the atmosphere more. All the runners in various combinations of clothing, some with gels, some without, many running for charities and most looking pretty nervous. It actually made me think I might like to try a full marathon one day, but first I have to destroy a half! So we moved forward, first at a walk then a jog then a run. Before I knew it we were over the timer mat and off. The first leg of the relay is pretty much flat and downhill although as you can imagine it was really congested. I was really conscious of the fact I was running with people who would be going a lot further than me and I wanted to make sure that I didn’t hinder anyone else’s progress as I weaved my way through the field. Like all people who have entered a busy race know, frequently I was trying to run through gaps only to find people running diagonally into me or jostling me backwards. If I am honest I am a little immune to the beauty of Edinburgh as a city so it was nice to be amongst runners commenting on the view to Arthur’s Seat and parts of this route are great. I saw a couple of photographers so did the stupid ‘thumbs-up’ pose at them or waved madly and before I knew it my watched beeped for the first mile! 8:34! That is fast for me at the minute. I know the route well having done the half a couple of years back and lets face it if you run in Edinburgh you will have run parts of this route. The miles ticked by all under 9 minutes and while I did feel like I was pushing it I wasn’t feeling particularly tired yet. Around mile 5 I decided to have one of my gels – here is my top tip do not rely on stuffing gels into the waistband of your shorts, mine kept trying to escape and I eventually accepted I would just carry them – unfortunately I couldn’t open it easily and had to stop to open it, that really frustrated me as I had been feeling like I was really in the rhythm. After finally managing to eat my gel then start off again I tried to get back up to speed but did struggle slightly for that mile so when my Garmin showed 9:43 I wasn’t surprised just a bit angry with myself. When I started off again my legs felt heavy but soon warmed up. It was a hot day and I was already roasting from the first leg. I took more water on and kept moving but my stomach started to hurt around mile ten and I slowed down. By mile eleven I made the decision to go to the loo and had to wait briefly in a queue but once I left I ended up walk/running the last two miles as my muscles had tightened up so much. But considering this was the longest run I have done since October 2012 I probably shouldn’t have been surprised, still a little frustrated. Having said that the crowds and other runners were great, everyone clapping and cheering. People offering out sweets, water and spraying runners with water- which was welcome. At mile 13 I saw the relay signs again, this time relay runners keep to the right. I quickly weaved through to the other side and was at the grass before I knew it. I found my teammates then collapsed to the ground and lay there for a bit while finding out which team was in the lead. Still my team, Team A, had been in the change over first. Woo hoo! We decided to head to nearer the finish line to cheer the teams in. Everyone did brilliantly. One of the other girls who was running legs 3 & 4 for the second team had overhauled my team’s lead and came down the last mile running really strongly. Then my team mate came barreling past shouting at us to find out how far in front she was. In the end my team won but only by 30 seconds, the competition element definitely livened it up where we were all cheering and comparing times. Brilliant fun. A couple of things that could be improved, please put more toilets at the start and the finish. Or at the end have toilets for runners only in addition, just it must have been annoying for the marathon runners to queue with all the spectators. Also it was pretty tough walking alongside the last mile of the race due to the width of the pavement. Maybe they need to get people across the race or direct them to the other side of race at the finish line where there is at least triple the amount of space. Especially for the people with the buggys who were having real problems. The final verdict though, great race bit of a rubbish goody bag burst most importantly we raised over £3, 000 for the Euan MacDonald Centre!!!! Much needed nachos and burgers after it all! Note how I am shovelling the food in! Author theInelegantHorseRiderPosted on June 8, 2013 June 10, 2013 Categories Race Reviews, RunningLeave a comment on Hairy Haggis Relay – The Point I realise I am competitive over really bizarre things!